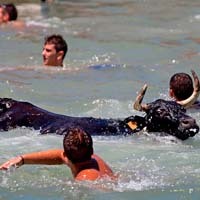 Have you ever wondered how a bull would do in the salty sea water? Is it as dangerous as on the land? Find out with this interesting article! The Bous a la mar is yet another celebration that takes place in the ever-joyful province of Alicante, in the beautiful Spanish White Coast. This is a very peculiar event that joins the sacred (the festivities around the cult of the Sacred Blood) and the profane (bulls and fiesta). Even though it is also a very popular tradition alongside the Mediterranean coast of Spain, especially in the Catalonia area, the city of Denia stands out as one of the oldest and most characteristic celebrations of this kind. Lasting for a week in the month of August, the Bous a la Mar (Bulls to the sea) usually lasts for a whole week, coinciding with the local Major Fiestas (around the same time as when the Sanfermines take place). Two main bull-related events take place during these days in Denia. The first of them is the running of the young bulls that takes place every day of the week, starting in the higher part of town, a square called La Glorieta, up to the makeshift bullring set up at the village’s port. This is a very similar tradition to the San Fermin Festival or many other bull-related events in which Spain abounds. The bullring is split in half: the first half is the port ground, while the other half of the bullring is supposed to be the sea. 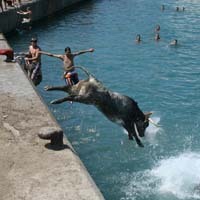 This is where the second bull-related activity takes place, the proper Bous a la Mar: once the bulls have arrived to the half bullring, the local youngsters try to make them fall into the sea without using their arms or hands. All sorts of tricks and stratagems are put into practice for this purpose, because he who makes the bull fall into the water is considered the winner. Once the bulls are in the water (as many of the participants, as well), a boat helps it make it back to the shore. Alongside this, there are also many side activities like concerts, street theatre, jugglers, and a wide gastronomic offer in the stalls set up at the city’s fairground. The city of Denia, a unique holiday destination, bursts with life during this week-long celebration. If you happen to be in the area, don't miss the chance of seeing a very rare event! Although very criticized by animal rights organizations and other collectives, the Bous a la Mar is a very popular celebration that happens in many other towns along the Mediterranean coast of Spain, being especially representative also the one that’s celebrated in Las Casas de Alcanar, Tarragona.